This study examines factors that affect employees’ awareness of their impact on corporate reputation (AICR). We distribute our questionnaire to 161 employees of Indonesian state-owned enterprises (SOEs) as our sample. Our main findings show that both perceived corporate reputation (PCR) and affective commitment positively affect AICR with PCR exhibits the greatest effect. It then can be concluded that building a good corporate reputation is the most effective way to increase employees’ AICR. Penelitian ini mengkaji faktor-faktor yang memengaruhi kesadaran karyawan bahwa tindakan mereka dapat memengaruhi reputasi perusahaan yang bergerak di bidang pelayanan milik pemerintah Indonesia. 161 kuesioner dianalisis menggunakan metode penelitian kuantitatif. Temuan utamanya adalah bahwa kesadaran karyawan bahwa tindakan mereka dapat memengaruhi reputasi perusahaan dipengaruhi secara langsung oleh seberapa bagus persepsi karyawan terhadap reputasi perusahaan tersebut dan komitmen afektif mereka terhadap perusahaan. Namun demikian, pengujian terhadap model menyatakan bahwa persepsi karyawan terhadap reputasi perusahaan memiliki pengaruh terbesar terhadap kesadaran karyawan, oleh karena itu disimpulkan bahwa cara efektif dalam meningkatkan kesadaran mereka adalah dengan membangun reputasi perusahaan yang bagus. Allen, N. J., and J. P. Meyer. 1990. Measurement and antecedents of affective, continuance, and normative commitment to the organization. Journal of Occupational Psychology 63 (1): 1-18. Arikan, E., D. Kantur, C. Maden, and E. E. Telci. 2016. Investigating the mediating role of corporate reputation on the relationship between corporate social responsibility and multiple stakeholder outcomes. Quality and Quantity 50 (1): 129-149. Arnett, D. B., D. A. Laverie, and C. McLane. 2002. Using job satisfaction and pride as internal-marketing tools. Cornell Hotel and Restaurant Administration Quarterly 43 (2): 87-96. Ashforth, B., and F. Mael. 1989. Social identity theory and the organization. The Academy of Management Review 14(1): 20-39. Barnett, M. L., J. M. Jermier, and B. A. Lafferty. 2006. Corporate reputation: The definitional landscape. Corporate Reputation Review 9 (1): 26-38. Boles, J., R. Madupalli, B. Rutherford, and J. A. Wood. 2007. The relationship of facets of salesperson job satisfaction with affective organizational commitment. Journal of Business and Industrial Marketing 22 (5): 311-321. Cable, D. M., and D. B. Turban. 2003. The value of organizational reputation in the recruitment context: A brand-equity perspective. Journal of Applied Social Psychology 33 (11): 2244-2266. Carmeli, A. 2004. The link between organizational elements, perceived external prestige and performance. Corporate Reputation Review 8 (1): 314-331. Cervellon, M. C., and P. Lirio. 2016. When employees don't 'like' their employers on social media. MIT Sloan Management Review 52 (2): 63-70. Cravens, K., and E. Oliver. 2006. Employees: The key link to corporate reputation management. Business Horizons 49: 293-302. Davies, G., R. Chun, R. V. Silva, and S. Roper. 2004. A corporate character scale to assess employees and customer views of organization reputation. Corporate Reputation Review 7 (2): 125-146. Dolatabadi, H. R., T. Ghujali, and M. Shahmohammadi. 2012. Analysis of employee's awareness from their manner of impact on the organizational reputation. International Journal of Business and Social Science 3(3): 220-228. Dutton, J. E., J. M. Dukerich, and C. V. Harquail. 1994. Organizational images and member identification. Administrative Science Quarterly 39 (2): 293-263. Ettenson, R., and J. Knowles. 2008. Don't confuse corporate reputation with brand. MIT Sloan Manage Review 49(2): 19-21. Fombrun, C., and C. V. Riel. 1997. The reputational landscape. Corporate Reputation Review 1: 5-13. Gotsi, M., and A. Wilson. 2001. Corporate reputation management: "Living the Brand". Management Decision 39(2): 99-104. Gunter, B., and A. Furnham. 1996. Biographical and climate predictors of job satisfaction and pride in organization. Journal of Psychology 130(2): 193-208. Hamermesh, D. S. 2001. The changing distribution of job satisfaction. The Journal of Human Resources 36(1): 1-31. Haque. 2001. Pride and performance in the public service: Three Asian cases. International Review of Administrative Sciences 67(1): 99-115. Helm, S. 2011. Employees' awareness of their impact on corporate reputation. Journal of Business Research 64 (7): 657-663. Levia, R., I. Ferrero, and R. Calderon. 2016. 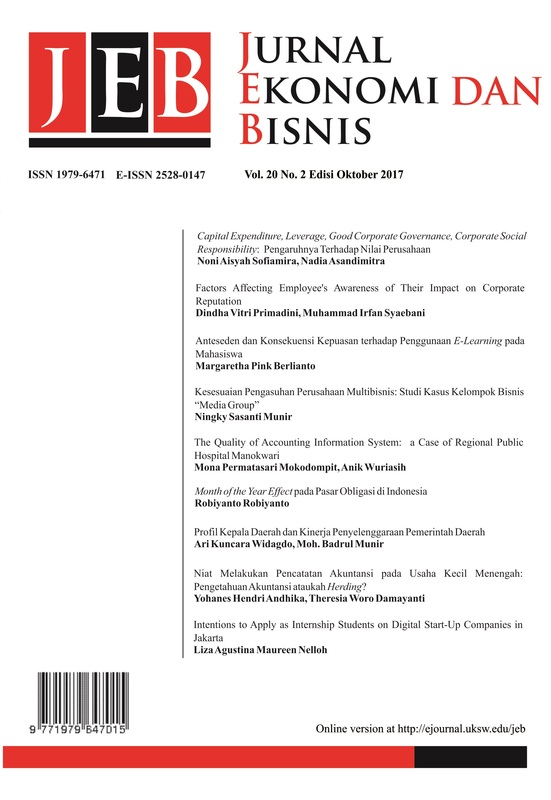 Corporate reputation in the business ethics field: Its relation with corporate identity, corporate image, and corporate social responsibility. Corporate Reputation Review 19 (4): 299-315. Li, H.G., Z. W. Chen, and G. X. Ma. 2016. Corporate reputation and performance. Entrepreneurial Business and Economics Review 4 (3): 181-193. MacKenzie, S. B., P. M. Podsakoff, and M. Ahearne. 1998. Some possible antecedents and consequences of in-role and extra-role salesperson performance. Journal of Marketing 62 (3): 87-98. Maholtra, N. K. 2010. Marketing research: An applied orientation. Upper Saddle River, NJ: Pearson. Maholtra, N. K., and D. F. Birks. 2007. Marketing research: An applied approach, 3th edition, Milan: Pearson Prentice Hall. Meyer, J. P., D. J. Stanley, L. Herscovitch, and L. Topolnytsky. 2002. Affective, continuance, and normative commitment to the organization: A meta-analysis of antecedents, correlates, and consequences. Journal of Vocational Behavior 61: 20-52. Mowday, R. T., and R. Steers. 1979. The measurement of organizational commitment. Journal of Vocational Behavior 14: 224-247. Nagy, M. S. 2002. Using a single-item approach to measure facet job satisfaction. Journal of Occupational and Organizational Psychology 75 (1): 77-86. Olmedo-Cifuentes, I., I. M. Martinez-Leon, and G. Davies. 2013. Managing internal stakeholders' views of corporate reputation. Empirical Article 8(1): 83-111. Perry, J. L., and L. R. Wise. 1990. The motivational bases of public service. Public Administration Review 50 (3): 367-373. Riordan, C. M., R. D. Gatewood, and J. B. Bill. 1997. Corporate image: Employee reactions and implications for managing corporate social performance. Journal of Business Ethics 16(4): 401-412. Robbins, S. P., and T. A. Judge. 2015.Organizational behavior, 16th edition, New Jersey: Pearson Prentice Hall. Shamma, H. M. 2012. Toward a comprehensive understanding of corporate reputation: Concept, measurement and implications. International Journal of Business and Management 7 (16): 151-169. Tajfel, H., and J. C. Turner. 1986. The social identity theory of intergroup behavior. Psychology of Intergroup Relations 5: 7-24. Tracy, J., and R. Robins. 2007. Emerging insight into the nature and function of pride. Current Direction in Psychological Science 16 (3): 147-150. Verbeke, W., F. Belschak, and R. P. Bagozzi. 2004. The adaptive consequences of pride in personal selling. Journal of the Academy of Marketing Science 32 (4): 386-402. Westover, J. H. 2011. Examining job satisfaction: Causes, outcomes, and comparative differences. Common Ground Publication (JHW).